I made these for lunch today as there was leftover tomato rice in the fridge from the other night (but no more lamb!). 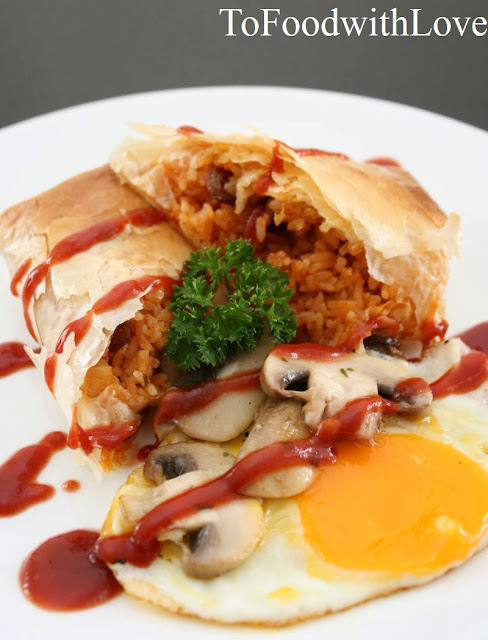 As I felt like eating something more substantial, I thought it would be nice to wrap it up in filo pastry (which I had gone out to buy this morning) and have that with two of my favourite foods - mushrooms and egg. This was ready in less than 20 minutes. All I had to do was take 2 sheets of filo pastry, brush them with melted butter and fold them in half. Then I placed a mound of the rice in the centre and wrapped it up into a little parcel, and popped it in the oven at 200°C for about 15 minutes. Once golden brown and crisp, I took it out of the oven and brushed it with more melted butter (for a little extra shine!). Then I served it with a fried egg and sauteed mushrooms, with a generous squeeze of ketchup and Sriracha chilli sauce. This would go really well with some sweet eggplant relish/chutney. Very interesting recipe... It looks very tasty!